A family tradition of Christmas surfing in Croyde bay in Devon got me thinking about how improvements to the original rubber wetsuit are potentially patentable. 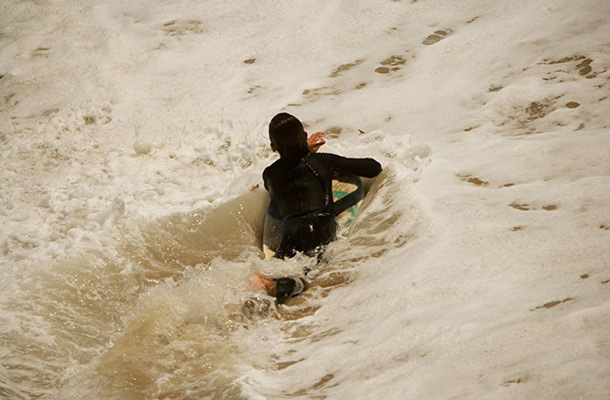 I say surf in the loosest sense, my sister goes surfing; my dad goes body boarding and I go body surfing. Now this isn’t because I’m hardened and love the freezing Christmas waters of the Celtic sea. It’s got more to do with my total lack of balance and inability to stand up on a surf board (or even lie down on one). In fact, many people across the UK decide to go for New years, Christmas or Boxing day dips in the sea for charity. A very noble and brave tradition taken up on sea fronts across the UK. I do however have one suggestion for these hardy fundraisers - wetsuits! These garments are designed to keep us warm and (reasonably) comfortable while swimming, surfing or even scuba diving. Years of history and therefore technology has been invested into these winter warmers. In the early 20th century the diving suit of choice was the canvas and rubber Mark V dry suit. Accompanied by the traditional bronze, lead and copper boots and helmets these suits allowed divers to reach the depths of the ocean. During World War II, Italian frogmen started to wear suits made of rubber. Later, in 1951, Hugh Bradner introduced a suit made of neoprene (though there is some dispute as to whether it was in fact invented by Jack O'Neill and others). This revolutionary suit allowed a thin layer of water in, so that it could lie between the suit and body and act as an extra insulating layer. Thus, the early modern day wetsuit was born. The development of wetsuits did not stop there. Neoprene was a tricky material to work with, although it was very flexible and well suited to the job, it is also sticky. Talcum powder was initially used to resolve this issue. Lining the suit with nylon provided a practical and smooth fit. In the 1970s the wetsuit was developed further. The stitching together of neoprene sheets created many holes at the seams. Techniques such as seam taping, gluing and binding were used. The improved use of blind stitching with a curved needle was also created. But how did we improve it further? In the 1990s a material revolution hit the wetsuit industry. Lycra and Spandex were used for the backing of wetsuits to provide additional flexibility. Titanium was weaved through wetsuits to help insulate the suit further. These continued improvements to wetsuit design have allowed swimmers to perform better, surfers to stay in longer and divers to go deeper for over 60 years. All of these aspects and improvements to the original rubber wetsuit are potentially patentable. The above inventions will have been closely guarded secrets up until their patents were filed, or even the product was first marketed. Remember, if patentable subject matter is disclosed before you file an application then that patent may not be viable. It could mean you lose a patents protection, which can last for up to 20 years. Why not find out more about patents by visiting the IPO’s IP for Business toolkit, a local Patlib or a patent attorney?